Just the thing for a rainy August day when you manage to get back to the office for a half-day of work while still not quite out of your summer sickness -- you had an uncontrollable, almost violent, coughing jag on the street when you went out to get a sandwich -- and everyone else in the office (if they're there at all) is looking tanned and relaxed or excited about the holiday weekend coming up. The skin tone and eye color on the actual magazine are worlds better than indicated here. It was delivered to my office just as I was packing up to leave for the day. 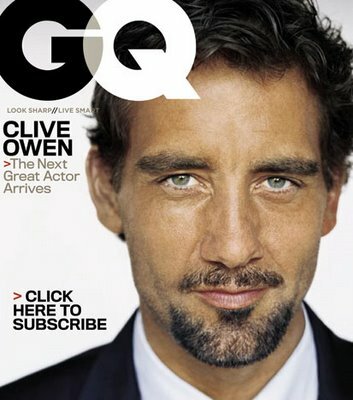 Yes, I work at a place where magazines with Clive Owen on the cover are occasionally delivered to my office. Like I often say, on my worst days all I have to do is remind myself that I have a job many people would kill for. Well, it is the flu -- or as my doctor says, a "flu-like" virus but not exactly the flu. Possibly tonsillitis too. Remember, I was sick with something similar about six weeks ago, though this time a sore throat and racking cough have added to the fun. The good news is that I have medicine now. A dollop of bacteria on top of the virus means it should respond to an antibiotic. My (gay) doctor asked if I had been around a lot of children lately. No, I said. Then -- and this had been in the back of my mind all along -- I noted that I'd been two-stepping at R's a lot lately. "You've been taking the lessons?" he said. Yes, and also dancing some on weekends. 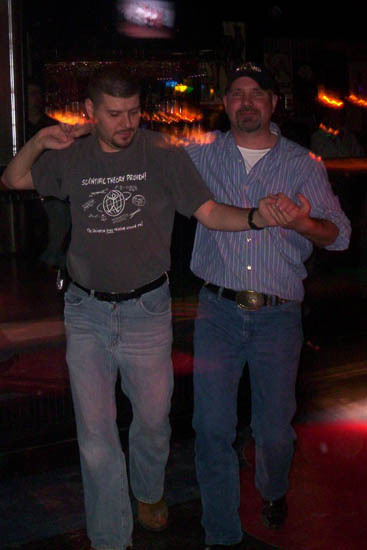 "Two-stepping," he said, "is like a daycare environment." I've been laid low by sickness for the second time this summer. Very bizarre. Sore throat with some associated symptoms, but I'm not sure it qualifies as a cold yet -- and God forbid, I don't think it's the flu again. No fever, fortunately. Tonight I watched the DVD of the Jonathan Demme-directed Neil Young concert film Heart of Gold, a performance recorded a year ago at the Ryman Auditorium in Nashville. It's a moving experience for Neil Young fans, of whom I am one, though I own only a couple of his albums. It struck me that his newer songs -- including the ones from his latest, post-brain-aneurysm CD, Prairie Wind, the centerpiece of the first half of the show -- probably would never have been the songs to establish a career. But they're mostly lovely and act as a kind of retrospective commentary, now that he's in his sixties -- a golden burnishment on his life, much like the amber light that bathed the Ryman stage. The first song I found myself spontaneously singing along to -- somewhat surprisingly, given the froggy quality of my voice today and the knife-like pain generated by any vocalization -- was "Comes a Time," from his 1978 album of the same name, one of the two I own. I continued a bit on the beautiful "Four Strong Winds," from the same record. When I was on my junior year abroad in Germany -- the 25th anniversary of which is upon us; stay tuned for another "on this date in history" post or two from that time -- I bought Young's Harvest on cassette, which I played over and over on my little boom box in my room on nights both lonely and otherwise. I will always associate it with that year. Getting back to the film, I can't resist noting that an otherwise sweet song about Young's daughter contains one of the worst lyrics by a great songwriter that I've ever heard (exacerbated by the fact that he made the line at fault the song's title): "Listen to the sound / Of this old heart beating for you / Yes I'd miss you / But I never want to hold you down / You might say I'm here for you." Um, yeah, you might . . . I guess. Watching Young onstage with his old friend Emmylou Harris reminded me of an under-the-radar duet album Emmylou made seven years ago with her old friend Linda Ronstadt, who is also an old friend of Neil's (she sings backup on his classic song "Heart of Gold," from Harvest). It's called Western Wall: The Tucson Sessions. On that album, Linda -- whom I will have to blog about someday, as she figured so prominently in my adolescent musical, and in some ways fantasy, life -- does lead vocals on a cover of Jackson Brown's "For a Dancer," with Emmylou and Neil lending exuberant backing vocals. It's the kind of musical gathering, and creation, that makes me wish I were their friend, too. I recommend the whole album, if you're into that sort of thing. I'm listening to it now. -- from "Pick Yourself Up"
Ten days from now will be the third anniversary of the day I moved out of the house I shared with my ex, and the official end of our eight-year relationship. It will mark three years of living in my little English basement with the carpet that I hate and the spacious backyard that I (and the dogs) love. The apartment I'm now anticipating moving on from in the relatively near future as I shop seriously for my first home to own. In some very personal way, I feel that, coincidentally, this is the end of a three-year period of . . . well, the word that keeps coming to mind is insanity, though that is probably a wee bit dramatic. I imagine that this description would come as a surprise to people who know me well. I think I have done a pretty good job of "presenting" as someone who has picked himself up, dusted himself off, and started all over again in a level-headed and self-respectful way. And in many ways I have: In the last three years, there have been long stretches of peace and reflection. Reading, exercising, enjoying the music and food and company I love. Getting the job done, as it were. But there's also been this intermittent . . . insanity. A private thing. Now, for the first time in three years it seems to be subsiding, dissipating, settling into something else. It doesn't mean I'm finally "over" the relationship -- in some ways, I feel less so than ever: Most of the anger has dissolved, and these days I'm more apt to be brought up short by memories of the things that were right and that I miss. The jokes we shared, the music, the private shorthand, the vacations (this happened when I was in Williamstown last month: He and I had stopped there on our way back from Vermont one summer, the summer of the year I consider our last happy one together). It's still hard to listen to the songs, look at the photo albums (I've taken virtually no pictures in the last three years, let alone put any in albums), even make some of the recipes I used to make for dinner. And still I feel the insanity is over and that this is the beginning of a new phase. The line is not a sharp one -- it's soft, blurry. But a line. Work still causes me tremendous stress and self-doubt. I don't know what my next career move will be, or when. I'm still struggling to believe in my ability to pull off this biography project. I don't know how long it will take to find a home to buy. My parents are failing more and more: shrinking, slowing, becoming increasingly dependent -- in my mother's case, more childlike -- both of them groping, in their different ways, for words. And yet still I feel the insanity is over. I may be wrong -- I'm prepared for that possibility -- but that is how it feels. Counting last Monday, this was the fourth night in the past week that I've been two-stepping. 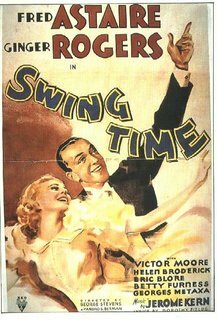 I can actually talk while dancing now, most of the time -- a sign, the teacher says, that the moves are beginning to settle into "muscle memory." I can't wait for Friday night. I am concerned that the articles about Sen. George Allen's verbal attack on a fellow Virginian are missing the point. The Aug. 15 front-page article seemed to emphasize Mr. Sidarth's feeling of being offended instead of Mr. Allen's objectionable behavior. If Mr. Sidarth had been African American and the senator had used a familiar racial slur, would the story be Mr. Sidarth's hurt feelings or Mr. Allen's choice of language? It also seems worth mentioning that Mr. Allen's mother is a speaker of French and Arabic who came to this country from Tunisia. "Macaca" is a derogatory slur used by speakers of French in reference to blacks, Arabs and dark-skinned people. Mr. Allen had reason to have knowledge of that particular slur based on his family background and his own knowledge of French. I don't understand how reporting the news can avoid mention of these facts. Reached Monday evening, Allen said that the word had no derogatory meaning for him and that he was sorry. . . . Asked what macaca means, Allen said: "I don't know what it means." He said the word sounds similar to "mohawk," a term that his campaign staff had nicknamed Sidarth because of his haircut. Sidarth said his hairstyle is a mullet -- tight on top, long in the back. A couple of weeks ago, I got a bee in my bonnet about buying a cup and saucer for my tea. I have some beautiful handmade ceramic mugs from Hinckley Pottery, but I've gotten into a rut, and it's a fact that tea tastes different in a cup and saucer. I have some nice cups and saucers, but they're antiques -- from a short-lived attempt at starting a collection -- and I'm wary of the lead used in glazes in the old days. So I had to find time in my schedule to go out and buy a nice, thin-lipped modern cup and saucer. I pictured it in white. On Sunday, I finally made it to Crate and Barrel, and there I bought a pair of cups and saucers in the Scoop design. What I especially like is that the cup holds eleven ounces -- more than the standard eight to ten and comparable to the amount that most of my handmade mugs hold, but not as much as the exaggeratedly large cafe au lait "bowls," which have their place in the world, but not for tea. Another cool design touch is that the Scoop cup rests around a raised circle in the saucer rather than within the traditional indentation. Sunday evening, I enjoyed a cup of peppermint tea from Trader Joe's (the peppermintiest tea I've found in stores) -- with lemon, because I like my mint tea to taste like a Ricola throat drop. I recently poked fun at the idea of deep-frying a veggie burger, even as I admired how much better it made it taste. Well, the other day I thought I'd try frying -- not deep-frying -- a veggie burger in olive oil as a change from my usual microwaving, and . . . Oh. My. God. What a revelation. So delicious, with a light moist crunchiness all over. And, because it's done with olive oil, not bad for you at all! I don't know why I didn't try this before. I've always microwaved my veggie burgers, always thought, eh, why dirty a frying pan? As a result, I had come to accept veggie burgers being no more than acceptable. I was telling fellow veggie consumer Diablo about all this in an IM the other night. He was shocked that I hadn't tried this method before, as he has always fried his veggie burgers in olive oil. "I thought everybody knew!" he said. Well, I feel pretty dumb. So if you're not in the habit of frying your veggie burgers in olive oil, you don't know what you're missing. I also now think that waiter at the restaurant who told me the burgers were "deep-fried" probably just meant fried. For more veggie-cuisine commentary -- it's a blog theme this week! -- check out Diablo's epiphany about a particular fake-meat delight that I've long known about. Now we're even. Coming back from dinner with my friend D at 2 Amys tonight (we shared the Santa Brigida and Etna pizzas), I had a musical driveway moment when this song came on the radio. You almost never hear it anymore, even on oldies stations (which no longer exist in Washington anyway), and it's always been a favorite of mine. I had to stay to the soaring end. Earlier today, I heard another favorite from the same era. This one gets a little more airplay, but it still makes me happy every time. Tonight I had dinner with my former neighbor S and, joining us later, her boyfriend, B. While we were eating, when I was telling her about my biography project, S introduced me to the concept of the "elevator speech." (We are good friends but, somewhat unbelievably, seeing as we still live only a five-minute walk from each other, we hadn't gotten together in about six months, so this was the first chance I'd had to describe it to her.) She felt I needed to work on my elevator speech about my book, as I still have a habit of sort of apologizing for it, or straining to justify it. She's right. The elevator speech, as you can see if you click on the link above, is from that sometimes-icky world of marketing-networking-motivationalism, which I don't associate her with at all. (She works with do-gooder nonprofits.) All she meant was that I need to work on presenting my project in a more positive, direct way that cuts to the chase of why I'm passionate about it and why the listener should be interested. By the time we were walking home, we had come back to the subject of the project. B asked me what the seed of it was, how I'd gotten interested in it in the first place, and without thinking I gave him an honest, 60-second answer. He said, "Now, that's a great elevator speech." We had dinner at The Saloon on U Street, where S and I both had a delicious veggie burger (mine with the addition of blue cheese). We asked the waiter what kind it was. Boca Burger. Neither of us is a big fan of Boca Burgers (I generally prefer Morningstar Farms). So we were like, huh -- Boca Burger? Really? What kind of Boca Burger? The waiter said, "Just a regular Boca Burger." Then he added, "Oh, it's deep-fried." That's why it was so good. And good for you! It's my sister's dog, whom I'm taking care of for the next week while she and her family are up on Mount Desert Island, Maine, where I've been wanting to go for a long time. The other night, I had a dream in which appeared Sam Elliott and Katharine Ross (his real-life wife). By the end of their "scene," he had turned into Sam Donaldson. Over the weekend, I baked butterscotch brownies from Joy of Cooking (not the new-fangled edition) -- another recipe, like Lazy Daisy Cake, that I've been making since childhood -- as well as chocolate sauce (for ice cream -- you'd be surprised how easy it is to make, and so much better than store-bought) from How to Cook Everything. From that same cookbook I made "basic pancakes" (with the addition of a quarter-cup wheat germ in place of a quarter-cup of the flour) and served them to my 13-year-old niece, who had spent the night with me to help the poodle acclimate himself to my place. My niece didn't put syrup on her pancakes, just a little butter. "I have weird tastes," she said.